A Taste of Paris Now Open! A retail space on Paseo de San Antonio next to Philz Coffee that has been vacant for years is now home to A Taste of Paris! The cafe is run by a sixth generation French Chef and features authentic French breads, sandwiches, soups, and pastries. For more info, you can have a look at their website over here. I've been getting into a development kick lately since we have several new projects about to break ground. Here is some information on the Irvine development project on First St., where Sony offices used to be. The first phase includes 364 condos and 4,660 sqft of retail. The goal is to be well into construction by Spring. Thanks to xThomasTroublex from the San Jose Development Forum for the info. Reminder: Celebrate San Jose's 233rd Birthday Downtown Today! Celebrate San Jose's 233rd birthday with tours of Peralta Adobe and Fallon House. Built in 1797, the Peralta Adobe has been a part of historic San Jose and is said to be the oldest building in San Jose. Music, cake and relatives of the founders of San Jose will all be at the event. Attendees will get an opportunity to see the new San Pedro Square Market. This event is free and open to the public. Barry Swenson is gearing up for developing the tallest development in Midtown San Jose (West San Carlos St. between Downtown San Jose and Santana Row). The plan is to have 800 transit-oriented units in towers up to 150ft tall along with 25,000sqft of ground floor retail. Eventually there will be a light rail station right outside The Ohlone. This would be a bold step towards transit oriented development outside of the Downtown area. A joint project by Green Valley LLLC The Ohlone is new residential and commercial development currently going through the City of San Jose’s approval process. Green Valley LLC is a joint venture by Barry Swenson Builder and Republic Urban properties. The Ohlone is a mixed-use, transit-oriented development (TOD). The project will have a maximum of 800 units with 25,000 square feet of neighborhood serving retail, which is a net increase in the retail space in midtown San Jose. The project is also being designed with significant amounts of open space achieved by having a mix of tall buildings and underground parking for residents and shoppers. In keeping with the principles of high-density development, the buildings will have a maximum height of 160 feet. The proposed Ohlone Mixed Use development site is located on 8.25 acres of land along West San Carlos and Sunol Street in San Jose. The property is classified as a Brownfield site and will undergo significant environmental remediation before construction begins. Previously a VTA bus lot and light rail staging area, this development will bring homes and retail to a previously blighted site. The Ohlone is a significant, multiyear community investment in San Jose that will be a model for future development. Designed to comply with the goals of the City of San Jose 2040 General Plan, this project is looking forward by embracing transit, bringing neighborhood serving retail to an underserved community and providing a livable, walkable community that is an alternative to single family homes. In addition, this project will exceed the City’s Build It Green standards by including several energy saving measures and environmentally friendly features such as solar power, the collection and reuse of water runoff, green roofs and diverting waste from landfills. Even the positioning of the building has been selected to best take advantage of the sun to keep heating and cooling costs low. Interesting news today. It looks like the 360 Residences high-rise in SoFA is in the process of being converted to a rental building. I was wondering why people haven't started moving in yet! I think this is actually a good idea, and the 200+ units could always be converted back to condos in the future. Instead of waiting a couple years for the building to fill up, the strong rental market in the South Bay will likely fill up the building really quickly. That means more foot-traffic to support downtown restaurants and retail, particularly in the SoFA district. You can already see the difference that The 88 and Axis have made downtown, so this building can't fill up soon enough! Black Friday in Downtown San Jose! The guys from San Franola Co. will be hosting a granola party, sampling a healthy way to snack. Later in the day, there will be an appearance by Streetbot, the urban art & apparel truck! We will be debuting 8 shirts, including two woman's shirts for the first time ever. Accepting Visa and Master Card via Square. Special Thanks to San Pedro Square Market, soon to be San Jose's newest shopping experience. 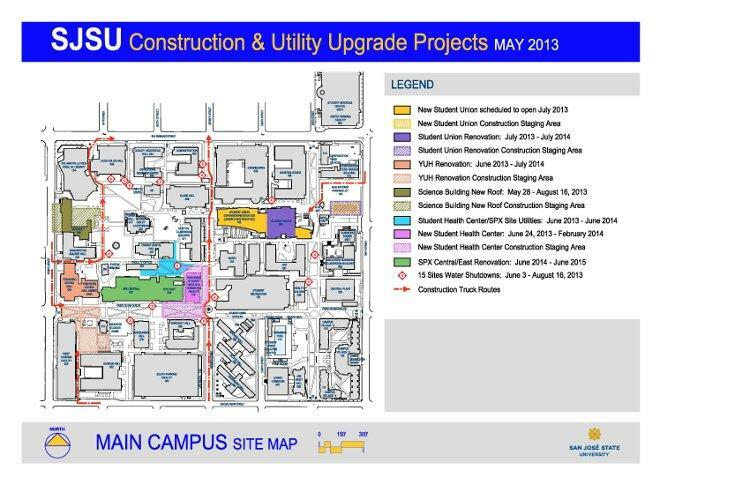 SJSU is Getting a New Student Union! Wow, very nice looking building below. Thanks Vadin from the San Jose Development Forum for the info. The architectural firm Perkins+Will has been tapped to design the New Student Union, including the expansion and renovation portions of the construction. The new building will feature a more modern glass and steel design sensibility but still blend with the more classical aesthetics of the current Student Union. Established in 1935 in Chicago, Perkins+Will has completed projects in 49 of the United States and 43 countries around the world. The firm has received numerous awards, including the American Institute of Architects Firm of the Year in 1999. Below are sample renderings of what the future Student Union will look like. Best wishes to all tonight! And if for whatever reason you are dining out tonight and still don't have a reservation, click here for a helpful list of options. As a follow up to the previous post, I am also informed that a new food truck will be launching at The Usuals' Black Friday event tomorrow from 12-3pm. It's called WOW Silog Truck and will serve Filipino-style silog dishes (combination of rice, eggs, and meats). Treatbot set the gold standard for food truck innovation with their Karaoke Ice Cream Truck, so WOW is also upping the ante with a full blown DJ booth inside the truck. For their premier, they're also going to have free beer and wine according to their Facebook page right over here. All the more reason to come to The Usuals for Black Friday! We’re fighting big box Black Friday with our own Black Friday! This Friday…join us for our own “Anti Black Friday” Black Friday. Twelve hours of sales Sales SALES!!!! From 8a-11a, take an additional 20% off of clothing, shoes, hats, and select accessories (jewelry excluded). Take an additional 15% off of all items on the markdown rack! From 11a to close, take an additional 15% off of clothing, shoes, hats, and select accessories (jewelry excluded). Take an additional 10% off of all markdowns. If you spend $60 or more, receive a complimentary set of Flip-up Glasses. All day! Get ready to throw them ‘bows!! Move out the way, yo! Details about Black Friday at Santana Row! As you all know, Thanksgiving is coming up this Thursday, and you know what that means: Black Friday is right around the corner! Don’t forget to come down to Santana Row for your all your Black Friday shopping needs (and wants)! We will be having great deals throughout the Row, plus amazing promotions in the Concierge. See below for some of the discounts being offered this Friday, 11/26: the best shopping day of the year! Amber India – Special Black Friday Brunch starting at 10:30am - 2:30pm with regional specialties. Plus, receive 10% off gift cards (valid on $100 gift cards). Atelier Aveda – Receive a free $10 gift card with every gift set purchase. Beau Bijou – 25% off everything in the store. Plus, enjoy Brazilian coffee and cookies in the morning and cheese and wine in the evening. Burke Williams Day Spa – Purchase a gift card for $105-$249 and receive an additional $25 gift card, or purchase a gift card for $250 or more and receive an additional $50 gift card. Club One Fitness – Enroll on Black Friday & receive one complimentary personal training session and one 50 minute custom massage. Donald J. Pliner – "Black Party": Cocktails, appetizers and an in-store Enter-to-Win drawing. Eli Thomas For Men – Save 20-40% off storewide. Fan Clothing – Receive 40% off of all outerwear. Furla – Enjoy champagne and cookies, plus select styles from the winter collection will be on sale. H&M – Opening at 7am with special discounts. Hotel Valencia – Receive a special guestroom rate of $169.00 on Friday, November 26th 2010 only. Some restrictions apply. Promo ID: PROBFP. InSpa – Free Skin Care sample – One per customer. Left Bank Brasserie – $5 Mimosas and Bloody Marys from 11:30AM - 6:00PM. Pink Stripes Boutique – Receive 20-40% off on select styles. Plus, spend $100 and receive a free designer scarf. Rosie McCann’s Irish Pub – Happy Hour specials all day long. See restaurant for more details. Roux Louisiana Kitchen – Enjoy 15% off your entire meal excluding alcohol with a receipt from any Santana Row shop. Starbucks – Open at 3am for early bird shoppers. Tales – Up to 50% off select items. Ted Baker – Up to 30% off. The Container Store – Enjoy free in-store Gift Wrap and Bow Demonstrations at 2pm and 4pm. A $25 gift card will be given away at each demonstration. Plus, spend $100 in a single transaction through November 28th and receive a $15 December Delight Card, redeemable 12/4 – 12/23/2010. Available while supplies last. Terms and conditions apply. Vera Bradley – Spend $100 or more and receive a free holiday tote. Plus, receive 25% off on select colors and styles. Vintage Wine Bar – Enjoy Mimosas, mulled wine and free pastries. Yankee Pier – Extended Happy Hour from 2pm – 6pm. For even more saving this Black Friday, make sure to stop by the Concierge! If you purchase a Santana Row Gift card, you will receive a complimentary Santana Row water bottle (a $15 value)! Also, for every receipt you bring into the Concierge, you will receive a Holiday Scratch Off Card, containing discounts to Santana Row shops & restaurants, for each receipt! Plus, every time you pick up a scratch off, you will be entered to win the grand prize: a $1,000 Santana Row shopping spree! But wait, there’s more! If you donate a coat to One Warm Coat at their drop off location by Pinkberry, you can go to the Concierge to pick up your free Santana Row lawn chair (a $10 value)! A Belated Congratulations to Josh Marcotte! 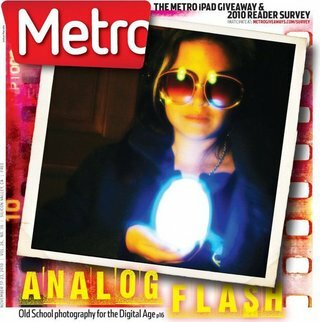 Congrats to KALEID Gallery artist Josh Marcotte (aka Lost San Jose) for landing the cover shot for the current issue of METRO Weekly Newspaper! The feature article interviews Josh and his use of analog cameras along with several other San Jose photographers. 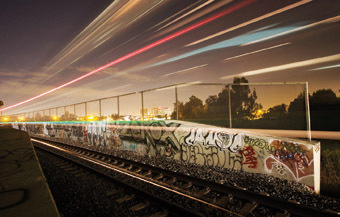 Marcotte is a photographer, writer and lifelong San Jose resident. He has been documenting his city for the past 10 years, first with a disposable camera, various 35 mm's, a 20D and most recently a 40D. I've been debating on whether to post about this for some time since the plant is located in Fremont, but I have to give Tesla some credit since they made an honest attempt to move to North San Jose first (they were blocked by government regulations on use of their loan funds). Very likely, you have already heard the news that Tesla has moved into the gargantuan NUMMI plant just a few miles away from SJ. The question I have, is how will this impact our city? I have a few thoughts on this. San Jose has really made a name for itself for incubating and promoting green tech companies. In fact, we have the largest green tech cluster in the US and potentially the world. You can find everything from alternative energy companies to technologies making existing products more energy efficient... all right in our back yard. While green tech may not be as exciting as the .com extravaganza that made us famous in the late nineties, having Tesla nearby complements not only our existing green tech companies, but will help the region hit a critical mass for green tech much the same way we did for semiconductors and internet technologies. Right before the turn of the millennium, I remember casually meeting the CEO of a tech company at SJC. It turns out he was planning to relocate his entire company to San Jose, and when I asked him why he told me "We want to be closer to ground zero. In our industry, this is where all the action is." We need to build that exact same kind of mentality for green tech. Green companies should be telling themselves that they have to be located in San Jose because that is where all the energy behind the green tech movement is emanating from. Having a company next door who is the leading pioneer of electronic vehicle technologies is going to help a lot in building that perception. So Tesla, welcome to the neighborhood! You can borrow the lawnmower anytime. Tesla took possession of the Nummi automotive plant in Fremont, California earlier this month and opened the doors to employee tours on Wednesday. In the months since Tesla announced the purchase, negotiations with Nummi have enabled the repurposing of a complete paint shop, four mechanical press lines, a blanking line (used to cut sheets of aluminum before stamping), and a crane for use in the Model S production process. The purchased machinery will simply be retooled and tested before use. The Hydraulic Press Line has started to arrive; 50 trucks are en route to transport the entire line to Fremont. Tesla is focused on hiring the most talented people, retooling the facility, and creating the most energy-efficient and innovative automotive production process in the industry. For an explanation of the manufacturing process, please read Manufacturing VP Gilbert Passin's recent blog post. A couple weeks ago the city council voted to to life the affordable housing requirements in redevelopment areas in order to get several major development projects moving along. A total of 4,227 units could be built very soon along the First St. Corridor alone. This will also undoubtedly help green light several downtown high-rises that have been percolating for a long time. For more information, have a look at this San Jose Business Journal article. Celebrate San Jose's 233rd Birthday this Sunday! This Sunday afternoon you'll have a great opportunity to tour of the Peralta Adobe and Fallon House (rarely open to the public) and get a sneak peak at the San Pedro Square Market. In honor of San Jose's 233rd Birthday, there will also be music, cake, and descendants of San Jose's forefathers on hand to chat with. All this in a location juxtaposing SJ's history with its future. Soon, the oldest building in San Jose will be surrounded by an eclectic hotspot featuring high-quality food, entertainment, and shopping. If you're wonder how exactly that will work, this event is a great one to come to. Hope to see you on Sunday! Santa Teresa is a region of San Jose I admittedly neglect to cover. Fortunately, there is a realtor named Sophia Delacotte that focuses on that region and has put up a website with local tips and info (news, events, school info, shopping, demographics, etc.). To have a look, just click here. The final part of Ballet San Jose's documentary takes a step back and talks about the impact a world class cultural attraction has on the city. This is my favorite part of the documentary and I definitely recommend watching it even if you haven't seen their other pieces. You'll even get some encouraging words from Apple co-founder Steve Wozniak about his hometown of San Jose. Just click the link below! 1.) Costco AMEX Card - gives you 3% back on ALL restaurant purchases that accept AMEX. 2.) idine - Gives you a 5-10% discount at participating restaurants, including the tip. No cost for participation, just sign up and register your credit cards. 3.) Open Table - You get a $1 credit for making an online reservation, and sometimes a $10 credit on select restaurants. Also no cost for participation. 4.) Restaurant.com - Let's you buy $25 restaurant gift cards for $10 or less. The 4 items above are not mutually exclusive, meaning you can stack all 4 discounts on top of one another if you get lucky, but by far the most substantial discount you can get is with item number 4, the Restaurant.com gift card. The way these work is simple. You pay $10 for a $25 gift card, but there is a small catch. You usually need to spend at least $35 and have a minimum party of 2 people to use the gift certificate. So let's say you go to a restaurant and spend $40. If you used a Restaurant.com gift, the net cost will be $25. However, Restaurant.com frequently discounts these gift cards even more. Right now, you can get an additional 80% discount by typing in "GOBBLE" at checkout. That brings the gift card price down to a ridiculous $2 and the cost of that $40 meal for 2 becomes $18. 449 restaurants within the San Jose area participate in this program, including 34 in Downtown San Jose and a few in Santana Row. So I think it would be nice to have easy access to their latest promotion right on The San Jose Blog. Their discount usually varies between 20% and 70%. Whenever you see an 80%, that is a good time to collect gift certificates. Also, once per year they have a 90% fire sale ($25 gift cards for $1). There is no better time to grab them, but the date is easy to miss and they don't advertise it in advance. Just make sure to type in the code at checkout to get the maximum discount! Don't miss the world premiere of Gunther von Hagen's BODY WORLDS Vital at The Tech Museum. Opens November 13.Tickets on sale now. BODY WORLDS Vital, in its first-ever showing, celebrates the potential of the human body and the body in motion. Featuring authentic human bodies, the exhibition shows the body in health, distress, and disease. These detailed anatomical studies, compositions, and representations allow visitors a penetrating gaze at what lies beneath the skin. The human body is built for action and experience. Intricately formed for optimal functioning, the living body is designed for survival, striving, and achievement. BODY WORLDS Vital tells the compelling story of how best to defeat life-threatening diseases such as cancer, diabetes, and heart disease through informed choices and lifestyle changes. Physician and anatomist Gunther von Hagens’ BODY WORLDS exhibitions are the original, precedent-setting public anatomical exhibitions of real human bodies, and the only anatomical exhibits that use donated bodies, willed by donors for the express purpose of serving BODY WORLDS'mission to educate the public about health and anatomy. The bodies are preserved through a remarkable process calledPlastination enabling visitors to learn what lies beneath the skin. Only $17.00 for Seniors 65+ or College Students with ID. All pricing includes admission to The Tech Museum. Members save over 40%. Become a member today. Audio guide rental is available for $5.00 more (English or Spanish). Add The Human Body IMAX documentary for only $5.00 more each all ages. The first Whole Foods in San Jose proper is now open on Blossom Hill. The 50,000 sqft store has some unique twists such as a Middle Eastern shawarma bar, 200 products from local vendors, 300 different types of beers, an in-store dining area, coffee bar made out of recycled materials, and a play area for kids. In fact, it's unique enough that Whole Foods will offer tours of the store to patrons. To balance out the good news with some predictable bad news, the Downtown San Jose Whole Foods has been delayed from 2011 to 2013. Maybe that will give them enough time to put rooftop parking back in the plans for that location. Groundwerx is now responsible for tree trimming services Downtown, adding to aesthetics and safety. The City Council is leaning towards agreeing to an aerial HSR structure (instead of further pushing for an underground alignment) in exchange for the ability to make design and materials decisions on the final structure. Lost Gatos Brewing Company is now open in the former home of A.P. Stumps (they also added tons of HDTVs and have a huge underground banquet facility). The renovated Civic booked its first 2011 show and will schedule a grand opening celebration. Paesano Ristorante Italiano, the first restaurant in San Jose's Little Italy, is set to open very soon. San Jose is about to take control of State Highway 82 to remove a bureaucratic step in developing or improving the historic route including Blossom Hill, Monterey Highway, and the Alameda. A new 3 story primary and urgent care medical clinic will be built at 17th and Santa Clara Street. It should be up and running by 2014. Express VTA light rail service has begun and is offered 6 times daily. Downtown Ice opens November 19th and will continue until January 17th. Kristi Yamaguchi will celebrate the grand opening on November the 22nd. This video is more oriented towards San Jose than the last Soul of the Community video I posted. If you have seen the previous one, you can fast forward to the 3 minute mark or so. Knight Soul of the Community 2010 - San Jose from Knight Foundation on Vimeo. If you feel like a dose of some local indie rock this weekend, check out Roosevelt Radio over at Britannia Arms on De Anza this Saturday! You can preview their songs right over here, or watch the video down below. There is a great link in the Merc today listing all of the holiday events happening in Downtown San Jose. You have great traditions like Christmas in the Park, Winter Wonderland, Downtown Ice, The Holiday Parade (ranked one of the best in the country), the Nutcracker. Then you have several stage shows ranging from the San Jose Symphony to several Pavilion concerts including the Radio City Christmas Spectacular. Now some items that I didn't even know about: $5 family movies at the opulent California Theater in SoFA, free concerts in the Cathedral Basilica of St. Joseph, and a new museum exhibit at The Tech (okay this last one I did know about). To read the full list in the Merc, just click here. Thanks Jon for the heads up! I know the San Jose Downtown Association is really pushing for an underground alignment for High Speed Rail, but I really like the design of that bridge. It looks almost like a super-sized version of the new pedestrian bridge on 280. It has potential to become an iconic structure in the San Jose skyline, especially if they are able to integrate some unique lighting into it. Plus, everyone would get a nice view of how beautiful our city is from the bridge. When watching the video, also look for the A's Stadium and new housing/office developments! Knight Soul of the Community 2010 - National from Knight Foundation on Vimeo. I love this idea. 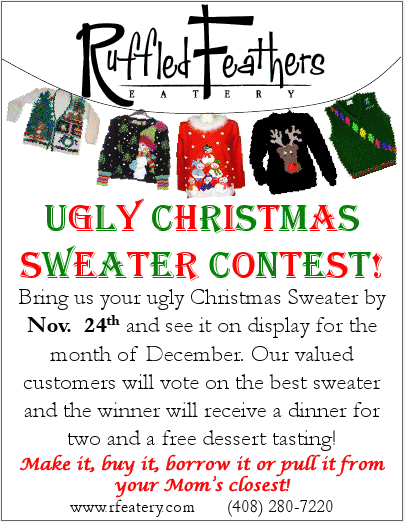 Ruffled Feathers Eatery in Downtown San Jose is having a contest to see who can find the ugliest Christmas Sweater. They're going to put up all of the sweaters they receive on the walls and customers will vote on their favorite in December. The winner gets a free dinner for 2 and dessert tasting (hopefully their homemade marshmallows are included in the tasting). All sweaters need to be in by November 24th to qualify for the contest! The Sobrato Tower FINALLY Get's a Tenant! It has been confirmed! PWC will be moving to 209,151 sqft of shiny blue glass in downtown San Jose known to most as the Sobrato tower. This flagship AAA office space has been vacant since completion in 2002. A few years ago it was destined to become the BEA headquarters, but Oracle's acquisition of BEA put a hold on those plans. Finally, this amazing building will be utilized. I was fortunate enough to tour the top floor a couple years after it was complete, and this is easily the nicest office building Downtown, if not in all of San Jose. It is unfortunate to have such a great space empty for so long... but that's all history now. Come early 2011, at least thirteen hundred workers are going to be very happy. For more details, just head over here. Another awesome evening of creative speakers, performers, demos, live painting and $2 art! 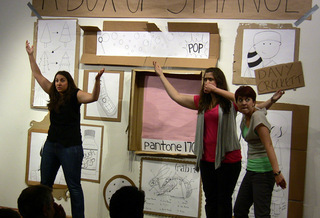 Cardboard Box Theatre Project is a a South Bay theatre company, founded in 2009 by Santa Clara University alumni, dedicated to the creation of new works and the presentation of old works in new ways. The driving force behind our productions is the desire to make theatre more accessible and engaging in all respects. We concern ourselves not only with the material we present and our audiences’ financial access to our productions, but also with the mode of presentation. Instead of creating distance between the world of the audience and the world on stage, we continuously blur such lines and allow the audience to see parts of our process that other companies try to mask. In true CBTP style, Act Like Trees and Leaf pokes fun at -- and has fun with -- the conventions of theatre as two actors audition for an amazingly unique (and probably unstable) director. KALEID Gallery artist Josh Marcotte will speak about his current featured exhibition Insomnia. Lost San Jose Nights. 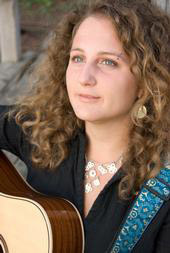 Singer/songwriter, Veronica Malki performs soulful, acoustic music resonating inspiration from nature and traveling. Her timeless style is comprised of Folk, Blues, Flamenco, and World Music qualities. 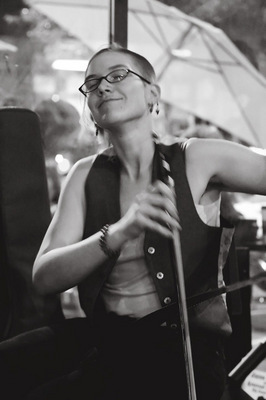 Musical Saw Workshop by DeatHat musician Kate Saturday - students, bring your saw! Reminder: Walk to Fight Childhood Cancer!